Bags of frozen mixed berries are widely available these days. The one I bought contained raspberries, blueberries and blackberries. Since there is no added pectin, this is a soft spread. Made with a minimum of sugar, it is tart and tastes of the berries. I’m inordinately fond of breakfast, but I don’t like to eat the same thing every morning. One day it might be pancakes or waffles, another day eggs with bacon, ham or boudin. But I’m also happy with good country bread, cheese and some type of cured meat or a salad of cucumbers and tomatoes with feta cheese and olive oil. Smoked fish with bagels, cream cheese and scallions is at the top of my list, as is a plate of fresh fruits with bread, butter and cheese. If I have cornbread from the previous day, I’m likely to crumble it in a glass with milk and sugar, a favorite treat from childhood. Most of us don’t have time to prepare and enjoy leisurely breakfasts except on the weekend, and even then it’s easy to fall into the same routine. This month’s recipes are all simple and fairly quick to do. The sweet potato bread and the two jams can be prepared in advance, and the others can easily be done in the morning. 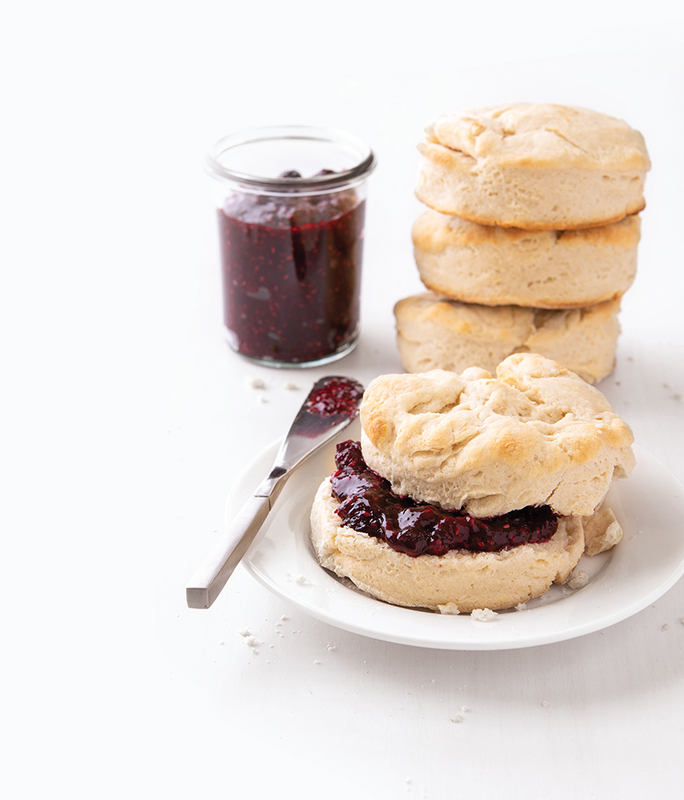 Low-gluten flour, which is great for biscuits, is available in two versions — self-rising and regular. I was a snob about using the self-rising variety until I baked two batches of biscuits, one from each type. When I couldn’t tell any difference between them, I put away my prejudice and now opt for convenience and speed of preparation. Place 2 cups low-gluten, self-rising flour (such as White Lily) in mixing bowl; cut in 3 tablespoons chilled butter and 2 tablespoons chilled lard or shortening with a pastry blender or use your fingertips to distribute the fats until the mixture resembles coarse meal. Add ²⁄³ cup buttermilk and mix with a fork just until dough forms. Turn out onto a lightly floured surface, knead a few times and roll out dough to a thickness of ½-inch. Using a floured 2-inch cutter, cut out biscuits and place on a heavy, ungreased baking sheet. Bake in preheated oven until tops are lightly browned, about 10-12 minutes. Combine 4 cups frozen mixed berries, ½ cup sugar and 2 tablespoons water in a heavy saucepan over low heat. Stir and increase heat as berries thaw. Bring to a boil and cook, stirring occasionally, until thickened, about 20 minutes. Cool, then transfer to serving or storage container and refrigerate. Measure the berries while they’re frozen. Once they defrost, it will take more berries to fill a cup and you will need more sugar. You don’t have to be on a gluten-free diet to enjoy these exceptionally crisp and light waffles.This batter is thinner than one made with wheat flour. Place 2 cups rice flour, 2 teaspoons baking powder, ¼ teaspoon salt and 1 tablespoon sugar in mixing bowl and whisk to combine. Add 1 cup milk, 2 eggs (lightly beaten), and 2 tablespoons melted butter; whisk to combine. Spoon batter on hot waffle iron and cook until crisp and browned. This bread is a treat for breakfast, either plain or buttered and toasted. If you want to save time, peel sweet potatoes, cut into chunks, boil until tender and drain. 1. Preheat oven to 350 F. Butter and flour a large loaf pan. 2. Sift dry ingredients into a medium bowl and set aside. In a separate container, combine mashed sweet potatoes and buttermilk and set aside. In a mixing bowl, beat butter and sugar until fluffy. Add eggs and vanilla and beat until smooth. Alternately add dry ingredients and sweet potato mixture until well combined. Do not over beat. If mixture is too dry, add additional buttermilk. 3. Pour batter into prepared pan, smooth the top and bake until a tester comes out clean, about 1 hour. 1. In a mixing bowl, combine cornmeal, salt and water. Stir well. 2. In a large cast iron skillet, heat bacon drippings. Add cornmeal mixture to skillet and cook over medium-high heat. Using a flat metal spatula, occasionally scrape the bottom of the skillet and turn the mixture, breaking up any large lumps that form. 3. Repeat this procedure until the mixture has browned and formed small distinct grains, about 20 minutes. Since the mixture isn’t cooked, this jam needs to be refrigerated or frozen. Place 2 cups persimmon pulp in blender. In a small bowl, stir 2 tablespoons Ball Instant Pectin and ½ cup sugar to combine. Add pectin and sugar to blender and process on high until thoroughly mixed. Fill clean container(s) with jam. Cover and refrigerate for immediate use or freeze. Freeze whole persimmons while they’re in season so you’ll have some to enjoy in the winter. A frozen persimmon is nature’s perfect sorbet.